Total knee arthroplasty has been around for decades and serves as a very successful procedure to alleviate pain and restore function in a knee with advanced degenerative joint disease. Over the years, there have been many advancements in surgical technique and even more so in implant design. One of the more recent technological breakthroughs in total knee arthroplasty is the use of a robotic assisted arm for enhanced preoperative planning and intra-operative guidance with dynamic joint balancing and bone preparation. This video outlines the operative technique used by the primary author in performing a posterior stabilizing total knee arthroplasty in a varus deformity degenerative knee using Mako robotic assistance. Knee osteoarthritis is a degenerative disease that causes progressive loss of articular cartilage. The incidence of symptomatic knee osteoarthritis is around 240 per 100,000 per year. Risk factors include articular trauma, occupation requiring repetitive knee bending, muscle weakness, large body mass, female gender, increased age, genetics, race (White > Hispanic > African American), and metabolic syndrome (a syndrome consisting of central or abdominal obesity, dyslipidemia, high blood pressure, and elevated fasting glucose levels). Pathophysiologic changes to the articular cartilage include increased water content, the collagen becomes disorganized, proteoglycans become altered and eventually decrease in amount, but the chondrocyte size and number stay the same. The subchondral bone attempts to remodel, forming lytic cysts with surrounding sclerosis. Bony osteophytes also form through pathologic activation of endochondral ossification. The synovium goes through progressive inflammatory changes, eventually becoming hypervascular and increasingly thick. The patient is a 66-year-old female who presents with a 2-year history of left knee pain without history of injury or trauma. The pain is exacerbated by prolonged ambulation, climbing stairs, and prolonged standing. Treatments tried have included bracing, anti-inflammatory oral medications, corticosteroid injections with good temporary relief, and formal physical therapy. She has a past medical history of hypertension, hyperlipidemia, and anxiety. The patient was comfortable, well-appearing, and oriented to time, place, and person. She ambulated with an antalgic gait. Examination of her left lower extremity revealed the skin was clean and intact throughout. Thigh and leg compartments were soft. She had normal hip range of motion without pain. Grossly, her knee was in mild varus deformity. There was a moderate knee effusion. She had knee range of motion from 0° to 115° of flexion. She had tenderness over the medial joint line. Her knee ligament exam was stable to anterior drawer, lachman, posterior drawer, and varus and valgus stress testing. Her extensor mechanism was intact, and she had no pain with straight leg raise. She was neurovascularly intact distally. Important radiographs to take before deciding to proceed with a total knee arthroplasty include weight bearing AP, PA flexion, lateral, and sunrise views. Some surgeons also like to review long leg alignment radiographs. The images for this patient revealed severe degenerative changes with loss of joint space in the medial and patellofemoral compartment with bone-on-bone contact, subchondral sclerosis, and multiple periarticular osteophytes. There was mild varus mechanical alignment. The patella was tracking centrally on the sunrise view. Additionally, a CT scan was obtained per the Mako protocol in order to perform preoperative planning and allow the Mako robot to perform accurate intraoperative guidance. The CT protocol is provided by Mako. Fig.1a Pre-operative AP radiograph showing the patient’s varus deformity in her left knee. Fig.2a Post-operative AP radiograph showing restoration of proper anatomic axis. Fig.1b Pre-operative lateral radiograph showing the patient’s varus deformity in her left knee. Fig.2b Post-operative lateral radiograph showing appropriate alignment and sizing of the femoral and tibial components. The natural history of osteoarthritis is progressive leading to increasing pain and disability. However, the rate of symptomatic progression is variable from patient to patient. In general, it is a slow progression where symptoms become more severe, frequent, and debilitating over months to years. As the arthritis and deformity worsen over time, patients experience a decline in their function including range of motion and ability to ambulate. Some patients have severe symptoms with only mild disease visualized on radiographs while others have little to no symptoms with severe radiographic disease. Surgeons should treat the patient and his or her’s symptoms. Treatment for osteoarthritic knees typically begins with non-operative management including activity modification such as reducing impact loading exercises and reducing weight. Nonsteroidal anti-inflammatory drugs (NSAIDs) are also first line treatment. Other non-operative treatment options include acetaminophen, physical therapy, corticosteroid injections, bracing, and the use of an assistive device such as a cane or crutch. A surgical option that is typically reserved for younger patients with isolated medial or lateral compartment arthritis is an osteotomy to off-load the affected compartment and correct deformity. Joint replacement options include partial knee replacement and total knee replacement. Risks and benefits to arthroplasty are weighed on an individual basis. Risks include, but are not limited to, infection, bleeding, blood clots, damage to surrounding structures, wound healing issues, leg length discrepancy, instability, continued pain, stiffness, fracture, and need for further surgery. 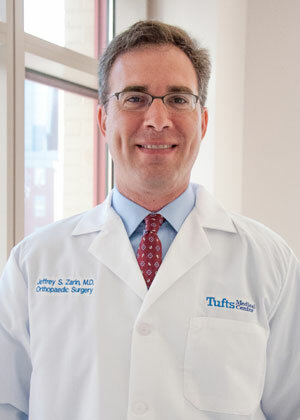 Total knee arthroplasty (TKA) is a successful surgical procedure that reliably provides pain relief and improved function in patients with degenerative joint disease. The patient presented with degenerative changes of the left knee. She had severe pain associated with activity and radiographic findings of moderate to severe arthritis. She had failed to obtain adequate function or pain relief with walking aids, bracing, physical therapy, injections, and analgesic medications. Based upon these findings and following a shared decision discussion with the patient that included outlining the risks of the procedure, a decision was made to proceed with knee replacement surgery. Patient selection for a Mako robot-assisted TKA depends largely on the judgement of the surgeon. Things to consider include sufficient articulation and range of motion of the ipsilateral hip in order to complete bone registration, the presence of metal in the operative leg possibly creating artifacts in the CT scan that could reduce accuracy and adversely affect the operative plan, and the surgeon’s comfort level with using the Mako. At this time, only certain implants are compatible with the Mako robot, so additional factors need to be carefully considered; they include poor bone quality affecting stability of the implant, poor soft tissue integrity preventing restoration of a stable joint with the compatible implants, and the type and significance of the overall deformity in the knee including flexion contractures and fixed varus/valgus alignment. Special equipment used in this surgery includes the Mako TKA System by Stryker.